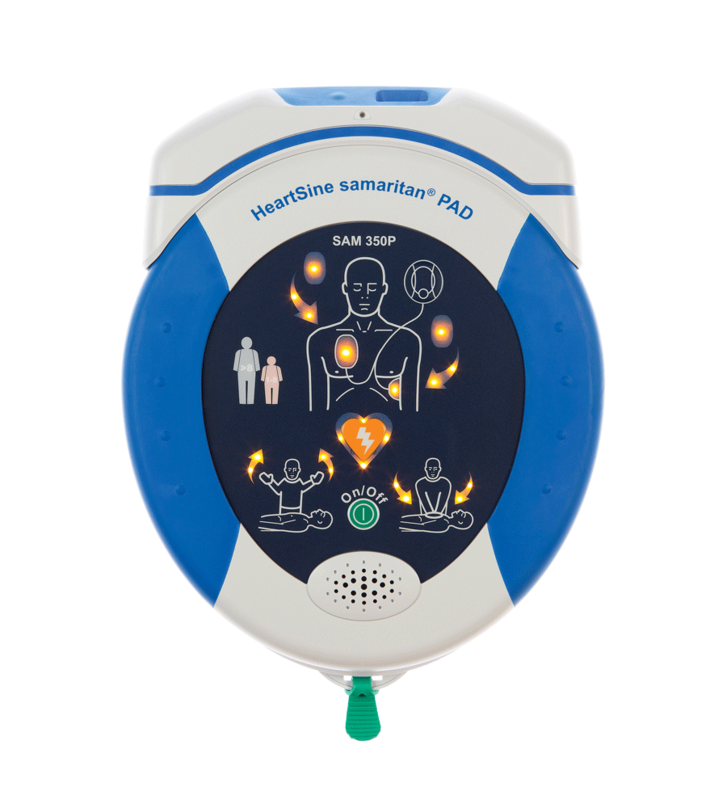 The HeartSine samaritan PAD 350P is available as both a connected model and non-connected model. Monitors AED programs by tracking AED readiness status, Pad-Pak expirations, CPR/AED training certificates and more. Communicates via Wi-Fi with LIFELINKcentral™ AED Program Manager to enable AEDs to be managed across single or multiple locations. Easy to understand visual and voice prompts guide the rescuer through the entire resuscitation process, including CPR—a key link in the chain of survival. With just ON/OFF and Shock buttons, offers a simple, straightforward two-button operation. Most portable AED with its light weight (2.83 lb) and compact footprint. Proprietary electrode technology and SCOPE biphasic technology, a low energy escalating waveform, that automatically adjusts for differences in patient impedance. Offers unmatched ruggedness with its high IP56 rating. The innovative Pad-Pak, an integrated battery and electrode single-use cartridge with one expiration date, offers one simple maintenance change every four years. Shelf life of four years means that the Pad-Pak offers significant savings over other defibrillators that require separate battery and electrode replacements. AED is backed by an 8-year warranty. Ready to learn more? Enter your preferred contact information to receive more information. HeartSine Connected AEDs are not available in all markets. Please contact your Stryker representative for details.